That saves you countless hours and frustration making writing winning email marketing series easier than you ever thought possible! ... The Secrets To Writing Winning Autoresponder Series SYSTEM is the quickest, easiest way to churn out winning email series to begin making more money from your email marketing! You see, over seven years ago I was faced with the same dilemma. I was hired to write an autoresponder series along with a sales letter. I completed the sales letter first, but then came the task of writing seven email messages and I was stumped. What do you say in the first email, then the second … the third ...and all the way to the seventh? What of the subject lines, the first paragraph, the call to action, appropriate selling personality, the 'from' line … all the way down to the last P.S.? I was soon scrambling to see what resources I could find online to help me out, but there was little apart from a $17 ebook by a now well-known online marketer. But when I read this book it simply gave samples of successful autoresponder series with little information about how to model them. This left me with just trial and error to go by … I had little choice. Now I’ve worked out a winning TEMPLATE for writing successful autoresponder series that makes writing successful emails a breeze. The more your prospects are exposed to your marketing message, the more likely they are to respond. Marketing tests have shown that prospects may require up to 7 contacts with an ad before they buy. An autoresponder series allows you to contact the subscriber several times as against a single visit to your website, thus increasing the likelihood of you making the sale. An autoresponder series is a set-and-forget marketing tool. Once you have set everything initially it requires little oversight after this. This frees up your time to other task that require human supervision. A personalized email sent automatically to your website visitor often catches the visitors by surprise, especially if they are not aware of how autoresponders work. This gives your business the added advantage of appearing prompt and consistent. The following up of your website visitors show that you want their business. A series of email over time help to build a relationship with the prospect. A one-time visit to your website cannot accomplish this. Because you are sending messages to the inbox of the recipient you are now part of their personal space and can appear more one-on-one to the prospect. Keep in mind that people do business with people and not ‘companies’. You would not achieve 100% open rate the first time your email goes out and so sending several follow up emails increases the chance that your emails would be read. Subscribers who may have missed an earlier email because they were busy or your email got filtered now have a chance to read your later emails. You’ll think with all these added advantages of using an autoresponder series that every online marketer and their mothers would be using one. But, truth be told, most people don’t have the slightest idea how to write an email series. Even if your website is converting visitors into customers at a satisfactory rate you can give your conversion rate a bump by capturing the emails of your website visitors and sending them reminders why they should buy your product or service. So if you a have a website selling any product or service online right now and you are NOT using email to follow up on your prospects then you could be losing up to half your sales … and even more! The bottom line is that you can boost your conversion rate by adding an autoresponder series to your present sales website. Until now I’ve kept this template to myself. 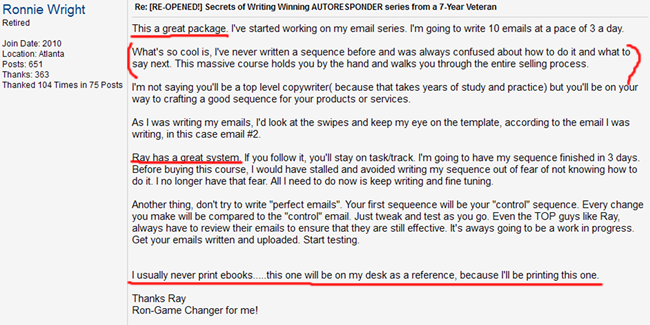 In fact, my clients pay me upwards of $2,500 to write them an autoresponder series. All they know is that the emails work but they NEVER imagined that I was following a “secret formula”. (Shame on me!) But I kept this SECRET FORMULA so close that I didn’t even reveal it to my copywriting coaching students until now. The ‘correct’ number of emails to use in your series. Sometimes you need less emails than other times depending on your market and what your back-end products are. Subject lines. What subject line models to follow with each email from the first to the last email in the series? What to say in each email. Just what CONTENT should be included in each email from the “Thank You For Signing Up” to the very last email. What to say in each paragraph of each email. Not only will I show you what subjects to cover in each email but exactly what to say in each PARAGRAPH of each email. I’ve made this as brain-dead easy as possible so you can do this with your eyes closed! Critical elements you must NEVER leave out. Just what you should NEVER leave out of your emails even as you customize my model to fit your market. Suggested schedule. How often should you send the emails? Every day? Every other day? I give you the exact schedule to follow so you know how to program your autoresponder on just when to send each follow-up email. A HUGE swipe file of winning autoresponder messages with autopsy-like analysis so you can see just how to use the TEMPLATE I share with you. As you study each swipe file, you can both model them and see how I use the templates in several different markets. BONUS solo ad templates. Writing a solo ad is a ‘one-shot’ affair and I share with you how to structure winning solo ads. It simply doesn’t get any easier than this. Even if you’ve never written an email in your life you can take this manual and plug it into your online business and see the results almost overnight. When I first revealed these secrets, some of my fellow copywriters thought I was CRAZY to give away secrets that have earned me hundreds of thousands of dollars for so cheap. But when I realize how lacking the market was on simple and clear instructions on writing autoresponder series, I knew had to do something about it. So if you have been struggling to write your own autoresponder series, then this is YOUR moment of truth. If you have been ignoring adding an autoresponder series to your marketing arsenal because of neglect or you were afraid of the copywriter’s fees, then worry no more. Of course I’d love you to hire me so I can write you a winning series for upwards of $2,500 but if you want to uncover how to do it yourself, simply download your copy of Secrets of Writing Winning Autoresponder Series and start crafting your own email right away. In Secrets of Writing Winning Autoresponder Series I share with you my template for churning out winning autoresponder series worth their weight in gold. I show you how to craft each paragraph of your emails and just what to include in every single letter. You'll enjoy the convenience of having these email TEMPLATES built into the Autoresponder Series Maker at your fingertips so you can fire up the program at any time and start writing a new series. It's a no-brainer install to your computer (Windows or Mac) and you can choose whether you want to write a 7-email series, 10-email series or a solo ad and follow the direction to fill in each section ... and voila! You have a marketing piece ready to pull in more sales. 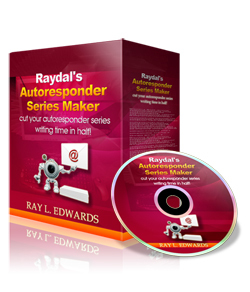 The Autoresponder Series Maker will make your life a lot easier and cut your autoresponder writing time in half, guaranteed! Other Online Businesses And Cash In Big! The number of online businesses looking for copywriters to craft email promotions is growing by the minute. Most businesses don’t have any idea about what to say after “hello” and it’s costing them a fortune. Other businesses say the same old, boring “cookie-cutter” things you’ll expect to see in an email and fail to sell like they should. Now that you’re armed with my winning formula you can write for these companies and become their hero. This is not a bad way to make a living because it’s a lot easier than writing sales letters—I know, I do a lot of those too! A lot of smart writers are now getting into email copywriting niche because even when a company may not have a ‘sales letter’ on their website, they almost always send out emails to their prospects. If you can show them how to profit more from those emails, then they’ll pay you handsomely for your efforts. When I designed this manual, I knew that customers would use this handy tool in different markets. But have no fear because selling is universal. The same PRINCIPLES that go into selling oranges is the same that go into selling an airliner. So even though the swipe files are particular to certain markets the instructions for writing the emails are market neutral. Such as 'place a testimonial here', 'give three strong benefits here' or 'answer their strongest objections here' ... etc,. At This Price, It’s A STEAL! Already my customers are ‘complaining’ about the incredible value I’m giving away in Secrets of Writing Winning Autoresponder Series. Considering that I could've very well kept these secrets for myself and continue making $2,500 a pop for writing autoresponder series, you can understand why I hesitated for so many years before I revealed this secret formula. 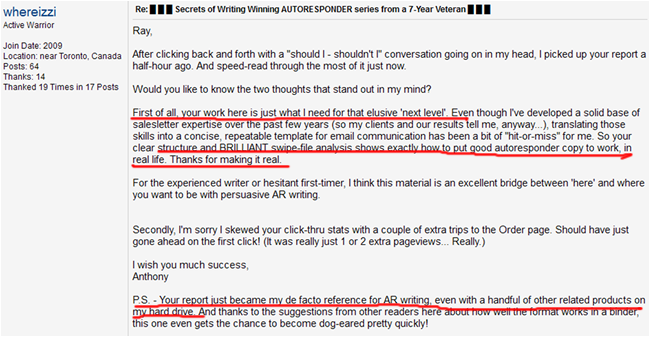 But with the field so wide open, there’s no way I could write so many autoresponder series and remain sane. So I don’t have to worry about competition or people even “stealing” my TEMPLATE because that won’t make a dent in my income. Because I know there are few good autoresponder writing products on the market I wanted to help other writers overcome the hurdles I had to break through when I first started out. That’s why all I’m asking for my secret formula is $297 $97 … yes, less than 10% of what I’ll make from writing an autoresponder series. NOTE: Manual would require a PDF reader such as the Adobe Reader and software will work on both PC and Mac platforms. Immediately after payment you'll be forwareded to a SIGN UP Page. Please DO NOT CONFUSE THIS WITH A SECOND PAYMENT. In fact, if you use my secret TEMPLATE and don’t recover your investment in increase sales from your present product, then I want you to ask for your money back! I’ve already told you how customers have been raving about the results they are getting from Secrets of Writing Winning Autoresponder Series. But I want you to download this manual today and give it a spin. Test out the emails you write and see the results you get. And if you’re not satisfied for any reason, then I'll issue you a courteous refund. Frankly, I don’t want a mere $297 $97 to stand between you and this business boosting tool. That’s why I’ve decided to place all the risk on my shoulders. You simply have NOTHING to lose for giving my system a try … NOTHING! You can test drive my Secrets of Writing Winning Autoresponder Series plus Autoresponder Series Maker Software for a FULL 180 Days and make sure it delivers everything I promised to help you write winning autoresponder series faster and make you more money or you don't pay a penny! 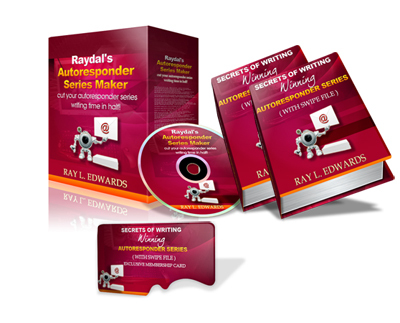 When you download the manual and software, dig through all 182 pages ... and test drive the Autoresponder Series Maker. Feel free to even steal ideas from my winning autoresponder swipe files ... and if you're not 100% confident that this product has saved you time and money, just tell me and I'll promptly refund your money, no questions asked. You get to try the entire course and software and even profit from these email writing secrets--and keep it only if you agree that you have made one of the best investment in your email marketing ever! I'm giving you 7 years of my email copywriting life packed in one bundle and I'm placing it in your hands without risk, then you get 100% of your money back if it doesn't multiply your email marketing profits. But That's Not All ..! As if I'm not already giving you enough value I'm also throwing in over $497 in FREE Bonuses. Now I know that in this industry "bonuses" are usually trashy ebooks or software that you can get for free by doing a Google search. But what I'm offering here are valuabe products I sell at other sites--not some useless garbage to clog up your hard drive. 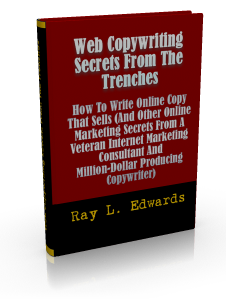 In this eye-opening product I share with you the secrets to writing hard-hitting salescopy that I've picked up over the years which have raked in millions of dollars! You get the complete book for FREE just for placing your order today. Others have laready paid the full $47 for this manual but you get this as an added bonus. This is a perfect compliment to the autoresponder series manual as you can learn the tips and tricks to make your email readers click the "buy" button! BONUS #2 (A $497 Value!) Over 50 hours of video copywriting critiques that I share only with my copywriting coaching students who pay $197 per month just to get access to them. But you can see these same video lessons in copywriting for getting my Autoresponder Writing Secrets manual and software. I know this is a CRAZY offer, but I don't want anything to stand in your way of getting these secrets that's why I'm literally DROWNING you in value. If I knew back then what I know now about writing persuasive email series I would’ve saved myself a TON of frustration and boosted my income by at least 300%! What I’m offering you will short-cut your success and get you started on the right foot. You can choose to go it alone or benefit from the experience of a veteran, in-the-trenches online email copywriter … your choice. Just imagine having a fill-in-the-blanks, simple email writing formula at your fingertips for every time you want to churn out winning emails and make more money from your list. Just imagine never having to worry about how to write email autoresponder series anymore. This is all possible, right now, if you make the right decision while you’re still thinking about it. 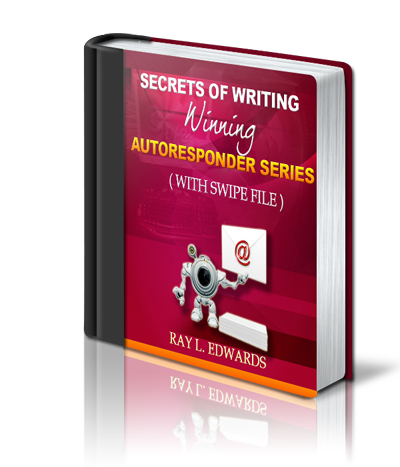 Download your copy of Secrets of Writing Winning Autoresponder Series right way. Immediately after payment you'll be forwarded to a sign up page. Please DO NOT CONFUSE THIS WITH A SECOND PAYMENT. ANY AND ALL FORWARD LOOKING STATEMENTS HERE OR ON ANY OF OUR SALES MATERIAL ARE INTENDED TO EXPRESS OUR OPINION OF EARNINGS POTENTIAL. MANY FACTORS WILL BE IMPORTANT IN DETERMINING YOUR ACTUAL RESULTS AND NO GUARANTEES ARE MADE THAT YOU WILL ACHIEVE RESULTS SIMILAR TO OURS OR ANYBODY ELSE'S, IN FACT NO GUARANTEES ARE MADE THAT YOU WILL ACHIEVE ANY RESULTS FROM THE COURSE, OUR IDEAS AND TECHNIQUES ON THIS WEBSITE. PARTICIPANTS ALSO ACKNOWLEDGE THAT ADVICE AND INFORMATION PROVIDED VIA LEARNCOPY.COM IS NOT INTENDED AS OR TO BE CONSIDERED AS SUBSTITUTE FOR LEGAL, ACCOUNTING OR OTHER SIMILAR PROFESSIONAL ADVICE OR SERVICES, AND SHOULD SUCH ADVICE OR SERVICES BE APPROPRIATE, PARTICIPANT IS ADVISED TO SEEK SUCH ADVICE OR SERVICE FROM THE PROPER PROFESSIONAL. 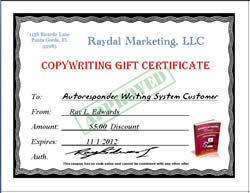 FURTHER, RAYDAL MARKETING L. L. C., DOES NOT ACCEPT ANY RESPONSIBILITY OR LIABILITY FOR INDIVIDUAL PARTICIPANTS PARTICULAR INTERPRETATIONS, USES OR APPLICATIONS OF INFORMATION PROVIDED, AND PARTICIPANTS INDEMNIFY RAYDAL MARKETING, L.L.C. FROM ANY SUCH LIABILITY.